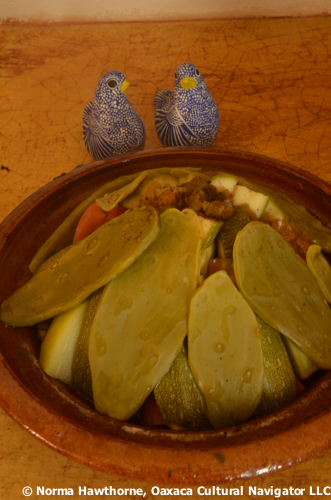 One of Morocco’s delights is tagine clay pot cooking. This heavy clay platter with conical top is perfect for one-dish meal preparation. I packed my tagine securely with bubble-wrap in Marrakech, seasoned it in North Carolina, repacked it, and have been cooking with it since arriving in Oaxaca this week. Coat clay platter with olive oil. Spread onion and garlic evenly on bottom. Add vegetables in a pyramid, densest ones first: peas (or garbanzo), potatoes, carrots, squash. 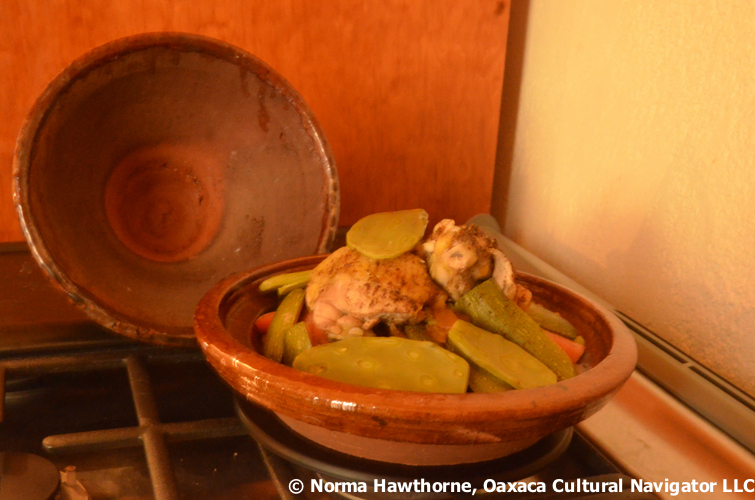 I’m in Mexico, so I added nopal cactus. You can try green beans or yellow squash. Arrange chicken so that the pyramid is secure. Top with the candied fruit and/or cilantro if you wish. Mix the mole paste with water. Drizzle the mole liquid evenly over the pyramid of meat and vegetables. Now, this is important! Use a heat diffuser on the stove top gas burner. (Use oven or a specially designed diffuser if you have electric burners.) Put tagine on the diffuser and turn burner to low. I’m using an 8-1/2″ cast iron Nordicware diffuser that I brought from the U.S. If you are cooking meat, cook for at least 2 hours. If you are cooking vegetables, this should be done cooking in about 1 hour. Check periodically to see that there is enough liquid. If too much liquid, then spoon it out. Turn burner off. Let tagine cool at room temperature for about 30 minutes before serving. If you are cooking in an oven, put the tagine in a cold oven, turn heat to 325 degrees, and cook as if you are making a stew. Turn oven off. Leave tagine in oven until it cools somewhat. Sudden temperature changes will cause a tagine to crack. Keep it oiled with olive oil when not in use. 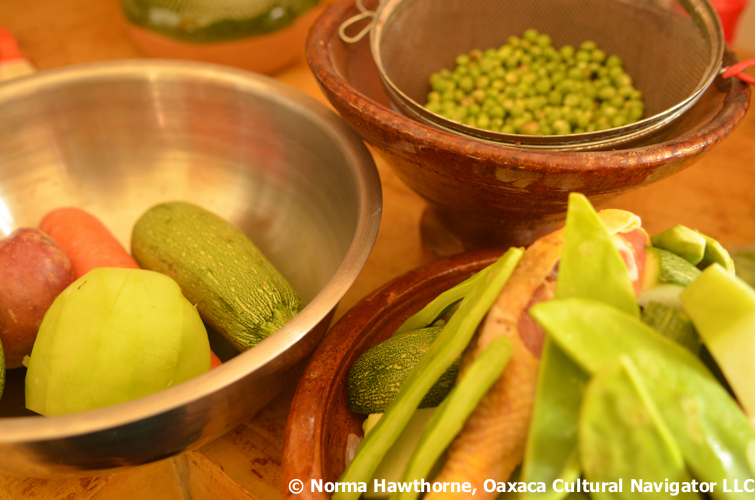 Hint: it’s apple season now in Oaxaca, and apples and raisins and pears and prunes would also be great additions. 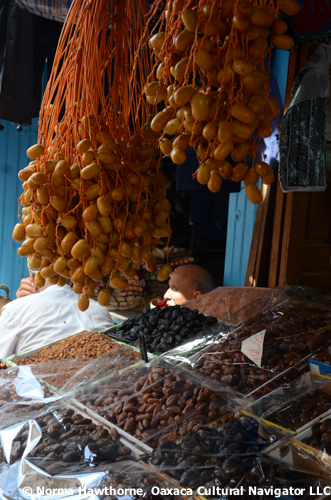 What about almonds, dates and dried apricots? Whatever you love and whatever is in season will work as long as you use the density and pyramid formula! 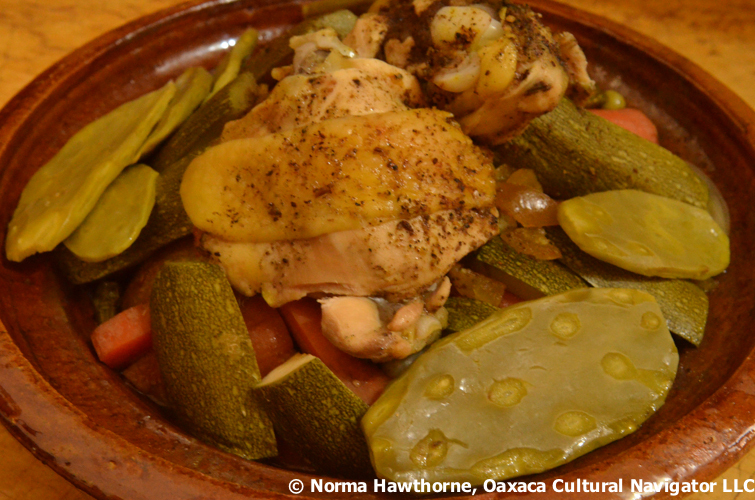 And, then there is El Morocco Restaurant in Oaxaca, highly rated by Trip Advisor. In Colonial Reforma, Reforma 905, tel: 01 951 513 6804 I haven’t been there yet, but want to try it! Thanks to Mary for directing me there! 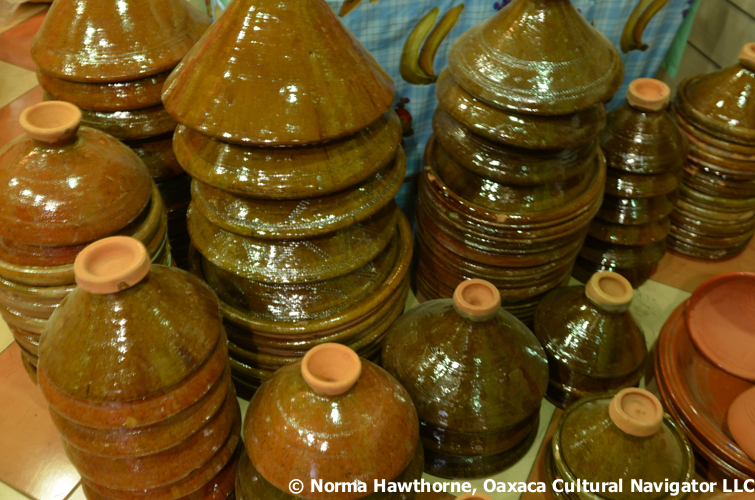 This entry was posted in Dining and Lodging, Food & Recipes, Oaxaca Mexico art and culture and tagged cooking, food, Mexico, Morocco, Oaxaca, recipe, tagine. Bookmark the permalink. 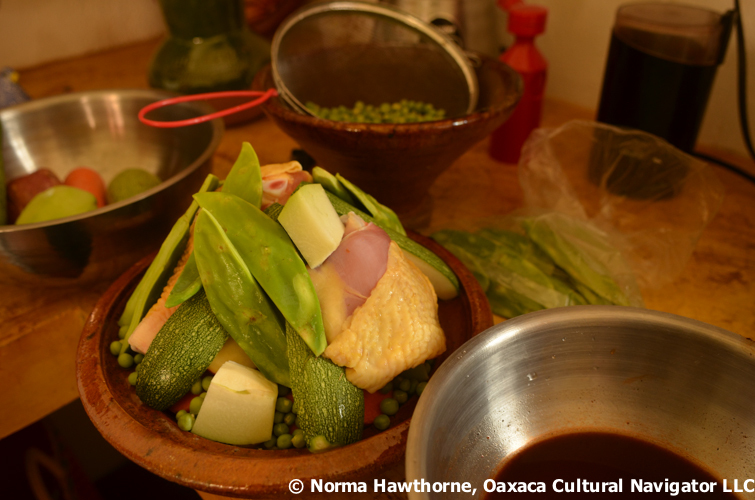 As I greatly enjoyed meals in Oaxaca during the time I spent there as a National Endowment for the Humanities Summer Scholar, and in Morocco as part of a Fulbright-Hayes Group Project Abroad Curriculum Development Team, I love your Oaxaca-Morocco Fusion Food post!